Converting a PDF file to EPUB format with ImTOO PDF to EPUB Converter is easy: drag and drop your files directly to the application and then simply click "Convert" to quickly turn the lot into EPUB files. You can also convert specific pages of a PDF file with this handy PDF to EPUB converter. Quickly and easily convert PDF files to eBook compatible EPUB format without installing Adobe Acrobat or Reader. Convert the PDF pages to EPUB in TXT or picture mode. Turn multiple PDF files into EPUB format at high speed. 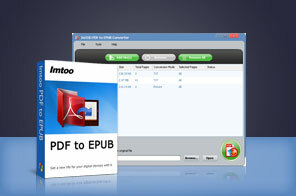 Convert specific pages from your PDF file. Preserves all original file features. Interface available in 7 languages: English, German, Spanish, French, Japanese, Simplified and Traditional Chinese. Convert PDF to PowerPoint (PPT), fully supports Microsoft 2010, 2007, 2003. A must-have iPad software lets you transfer songs/videos/DVD movies among PC, iPad, iPod, and iTunes.